In 1962, entomologist Jean Ruelle — as if possessed by the unborn spirit of Rachel Whiteread — filled a mature Macrotermes michaelseni mound with cementitious slurry, waited until it hardened, and then eroded every bit of the sculpted soil with water and trowels. The revealed solidified negatives was nothing short of spectacular. Of course, Ruelle and all the other entomologists who have performed similar “moundectomies” after him weren't actually pandering for a solo show at the Guggenheim or Tate Modern. 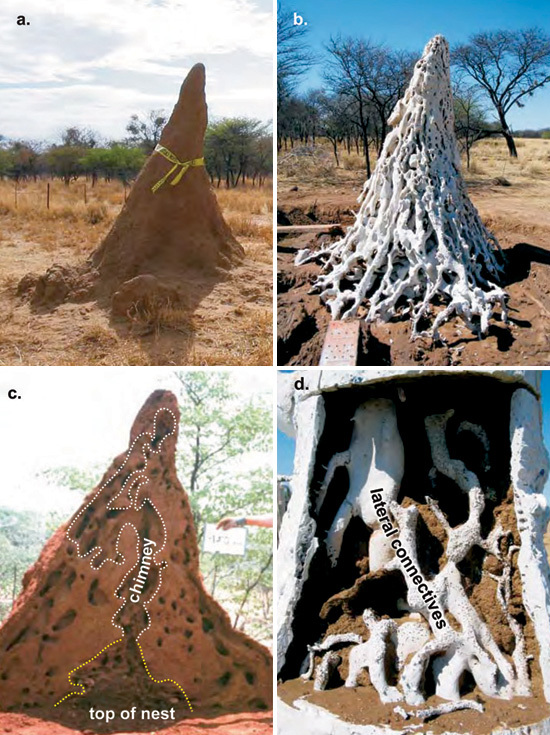 In actuality, they were trying to find out how these earthen towers — which serve the respiratory needs of millions of termites busily tending to their underground fungi-farms — self-regulate their living environment in response to changing internal and external conditions. They were investigating as well whether similar principles could be used to design buildings that need few or no mechanical services (e.g. heating and ventilation) and so use less energy and other resources than conventional structures. Understanding how these mounds function, then, might inspire new types of structures that are self-suficient, environmentally friendly and cheap to run. Evidence suggests that the temperature inside termite nests rarely varies by more than a few degrees, though outside temperatures can range from below freezing at night to 40 degrees Celsius during the day. Researchers believe the structure of fine tunnels and ducts inside the mound play an important role in regulating temperature, as well as moisture levels and the replenishment of oxygen. 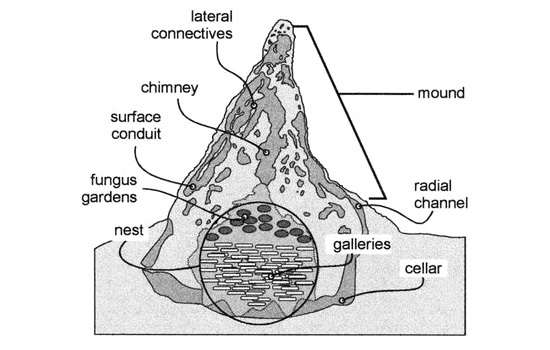 It seems that different parts of a mound's structure control different aspects of the nest environment. Moisture, for instance, appears to be regulated both in the mound's underground 'cellar' and possibly through evaporation from the top of the mound. 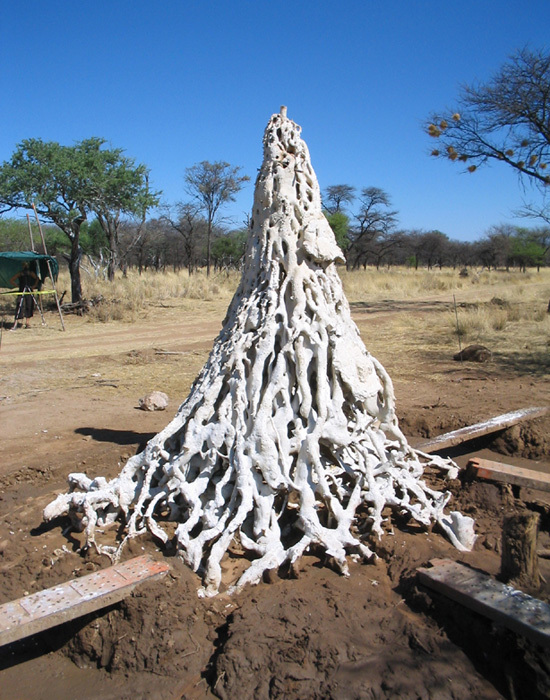 And although the termites must generate waste, none ever leaves the mound, indicating that there is some kind of internal system for recycling waste. But what is most remarkable is that all this is achieved without drawing any energy from the outside world, or, as [Dr. Rupert Soar of Loughborough University's School of Mechanical and Manufacture Engineering] puts it, “they do it without being near the power station”. “As we approach a world of climate change, we need buildings that are more responsive to our environment,” says Soar. If the average temperatures rise, he explains, there will not be enough energy to power air conditioners around the world. And of course, there is also the possibility of constructing similar structures suited for use not only on arid, hostile environments on Earth but maybe one day on the Moon and beyond.